When the 2016 Cleveland International Piano Competition and Festival gets underway on July 24 at the Cleveland Museum of Art, patrons will discover that CIPC is a true destination event. This year’s attendees will not only get to hear a field of talented pianists from around the world compete for the first prize of $75,000 — plus three years of management services, a New York City debut, and a CD on the Steinway & Sons label — they can also attend a myriad of activities that celebrate the art of the piano. “Creating the Festival has been an evolutionary process,” Westhuizen said, noting that it grew out of a response to surveys the Competition’s Audience Committee conducted during the 2011 competition. As a result of those surveys, special events including a Jury Round Table, Competition Conversations, and Lectures were added to the 2013 Competition in order to engage audiences in a different way. Lectures and workshops continue on Thursday, July 28 at 10:30 am in CMA’s Lecture Hall with a Competition Conversation with the 2013 Mixon First Prize winner Stanislav Khristenko (left). 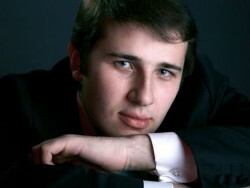 The Conversation will be hosted by noted Cleveland pianist and documentary film interviewer Zsolt Bognár. On Monday, August 1 at 10:30 am in CMA’s Lecture Hall, Westhuizen will lead a Jury Roundtable Discussion. Topics such as the impact of music competitions on careers and what jurors listen for during performances will be addressed. On Thursday, August 4 at 10:00 am and 1:00 pm in Mixon Hall, members of the competition jury will present master classes for local piano students. The Festival will also include three special performances. On Saturday July 30 at 8:00 pm in the Maltz Performing Arts Center, the dynamic piano duo of Anderson & Roe will present a concert of two-piano arrangements ranging from the sonatas of Mozart to modern music by bands such as Coldplay. The following evening, July 31 at 8:00 pm, also at the Maltz Center, jazz pianist Dan Tepfer will present a program titled Goldberg Variations/Variations. “I thought it would be fun to have a couple of concerts of music that isn’t for solo classical piano,” Westhuizen said. On Thursday, August 4 at 8:00 pm, Leonid Nediak and Chaeyoung Park, two finalists from the 2015 CIPC Young Artists Competition, will present a Young Artist Showcase Concert in Mixon Hall. Nediak and Park will be joined by area young pianists Liliana Garlisi, Yun Cao, Maksym Mahlay, Charles Fernandes, Catharine Baek, Lewis Zou, Stephanie Yen as members of the Junior Jury. But wait — there’s more. The Festival will also include films. “The whole idea with the film series is to highlight pianists whose lives have been impacted by and have helped shape the world of piano competitions,” Westhuizen explained. All showings will be held in the Cleveland Museum of Art’s Lecture Hall. The series begins on Wednesday, July 27 at 10:30 am with the premiere screening of Zsolt Bognár’s interview with Yefim Bronfman for his Living the Classical Life series. 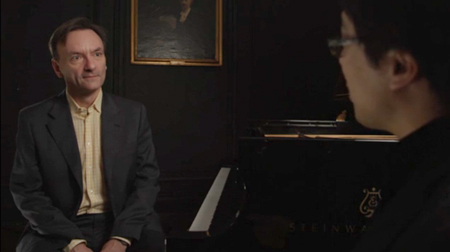 Screenings of the series will continue on Friday, July 29 at 10:30 pm with Bognár’s interviews with pianists Stephen Hough (above) and Marc-André Hamelin. It’s all about Martha Argerich on Tuesday, August 2. During the 3:00 screening of the film titled Argerich, Stéphanie Argerich follows her mother through the public concerts and private moments of a family who have lived in the limelight of the international stage. The film series will conclude on Wednesday, August 3 at 3:00 pm with Christopher Nupen’s Daniil Trifonov: The Magics of Music. 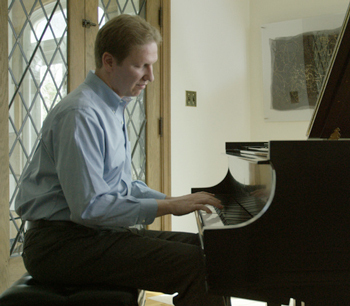 This new film provides a portrait of the young pianist and composer. Highlighted by interviews and concert footage, the film won a Silver Medal and the Accolade Award at the New York Film and Television Festival. Published on ClevelandClassical.com July 5, 2016.